Dirt and grime always seem to find their way onto our favorite pieces of furniture, like sofas, love seats, recliners, and dining room chairs. Furniture is something that we use every day. If you have kids or pets, your furniture is taking an especially hard hit. Dust, pollen, germs, food crumbs, stains, and other blemishes are inevitable. Luckily, they don’t have to mean your furniture is ruined. Let Southside Chem-Dry provide you with a professional upholstery cleaning that extends the life of your furniture and is safe & healthy for your kids and pets. A deep, healthy, and fast-drying upholstery clean will have you back to enjoying your like-new favorite furniture in no time. 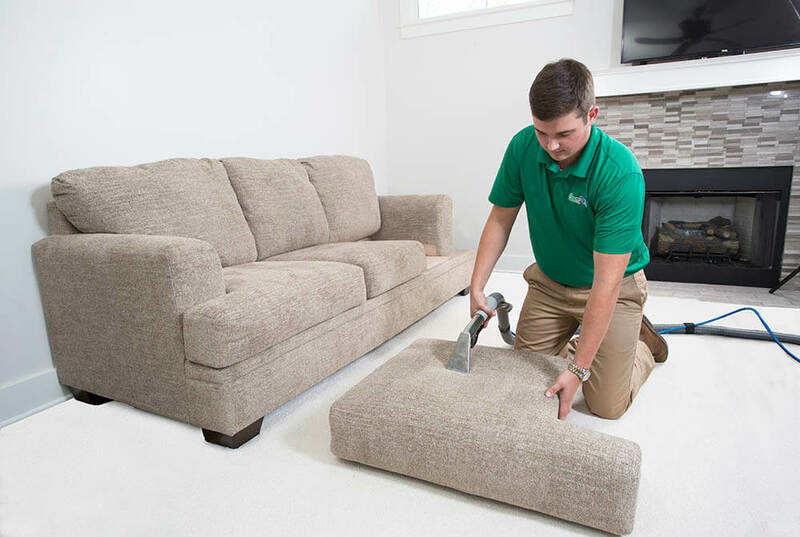 Our highly-trained technicians specialize in renewing upholstery to its cleanest and brightest condition. We leave your home and newly clean furniture healthier and happier. In order to get your furniture incredibly clean, we use The Natural®, the same eco-friendly carbonated cleaning solution we use to give your carpets that deep-down, healthy clean. This carbonated solution digs down deep to bring stains to the surface to be removed and allows us to use less water on your furniture to get a deeper clean. This means that upholstery cleaned by Southside Chem-Dry dries much faster and resists stains for longer. Envision millions of tiny bubbles working away at breaking up the dirt and grime trapped deep within the fibers of your upholstered furniture so they can be easily whisked away. Our fabric-cleaning equipment gently agitates the fabric and pulls stains away. That’s how our safe and non-toxic carbonating cleaning solution, The Natural®, revitalizes your furniture for a fresh, healthier, longer lasting clean. We’ve made sure to keep our cleaning solution eco-friendly and compatible with nearly any type of fabric or material. And since The Natural® doesn’t contain any soaps or detergents that can leave behind a sticky dirt-attracting residue, your upholstery stays cleaner longer. Our premier furniture cleaning services are strong enough to defeat the deepest stains, gentle enough not to damage your furniture, and safe for your entire family. Southside Chem-Dry’s non-toxic cleaning system leaves your upholstery as fresh as the day it was purchased, and actually helps it stay that way longer. Service areas include: Virginia Beach, Norfolk, Chesapeake, Portsmouth, and the surrounding communities. Give us a call today to clean your furniture & upholstery!